Dubai is considered to be the place to go if you like normality to be supercars and hypercars roaming the roads. Such is the concentration of exotic cars in the middle-eastern city that even the cops have resorted to driving around in them, to ensure no one decides to speed away from them. However, there is a dark side to this story as well as you can find numerous exotics rotting away slowly in garages and parking lots being slowly eaten away by the sands of time that surround the city. Dubai reached the zenith of its economic prosperity in the 1990s and early 2000s. However, the economic slowdown of 2009, battered Dubai and many people started to leave the city. In the process of leaving, these people left behind a whole host of exotic cars. The results are quite painful to see and there are 100s of these cars left to rot around the city. In this post we take a look at 10 of these exotics left to die in Dubai. Bugatti is not a brand that you can you can easily get access to. The French hypercar marque profiles you and your lifestyle before they’ll hand over the keys to one of the fastest cars ever built to you. The Veyron seen here was left to rot when the slowdown of the economy hit and till date, the owner hasn’t come to claim it. The Bugatti Veyron was once the fastest car in the world and is powered by a quad-turbo 8.0-litre W16 that produces 987 Bhp. 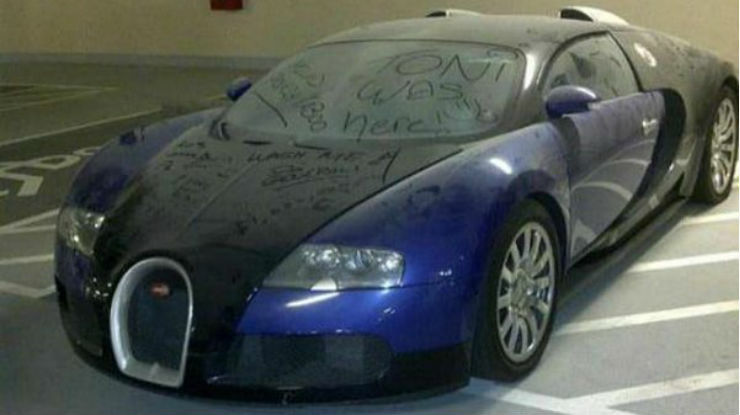 Considering the condition that this Veyron has been left in, it would seem that this owner managed to slip through Bugatti’s vetting system. The Ferrari Enzo was the Italian supercar marque’s halo car before theLaFerrari. Only 400 of these Italian stallions named after the carmaker’s founder were ever built. 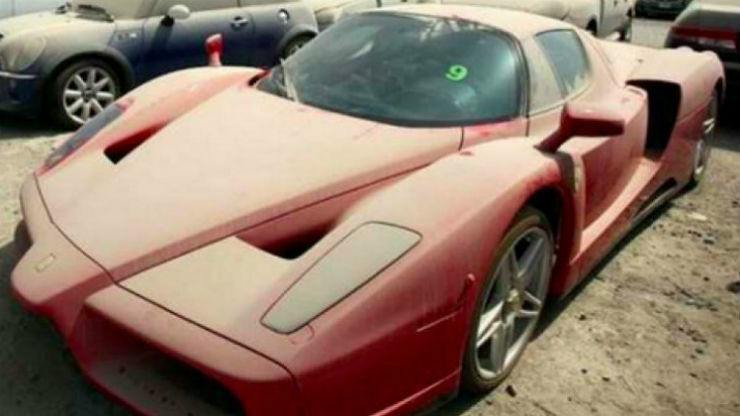 The British owner of this neglected prancing horse left it in a Dubai parking lot after the fines kept piling up. This hypercar is powered by a 6.0-litre V12 engine that produced 651 Bhp. The Aventador Roadster was launched in 2012 and is still one of the most powerful roadsters around. The Aventador Roadster is powered by a 6.5-litre V12 engine with 690 Bhp and can go from 0-100 km/h in 3 seconds and onwards to a top speed of 350 km/h. This rather sad mage of the roof-less raging bull is from an apartment complex in Dubai where it has remained untouched for over 2 years now. The Cadillac Escalade is a massive SUV that has become the choice of high rollers and powerbrokers wherever it is sold. However, even this mighty SUV has been gathering dust in Dubai after its owners left the Emirates never to return. The Flagship SUV from Land Rover is extremely popular around the world and is used by Presidents, Prime Ministers and the rich and famous. This top-of-the-line Range Rover Vogue was left to rot in a parking lot in Dubai and it has been months since it was moved from its current location. This one is perhaps the one that will really bring a tear to your eye. 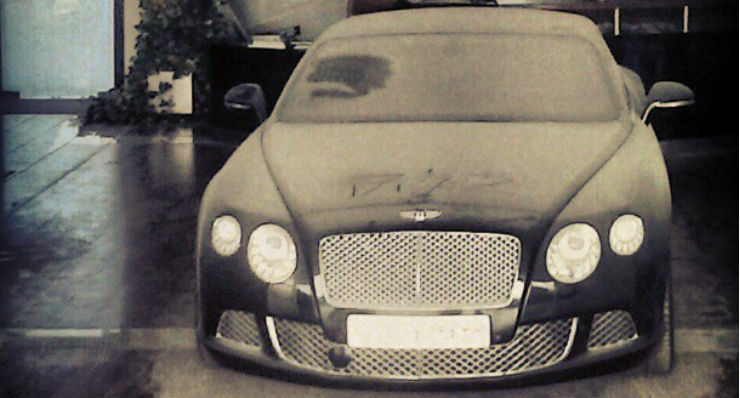 An entire Bentley showroom was left abandoned in an upmarket Dubai locale during the economic slowdown of 2009. There are many Bentleys left abandoned in this showroom and the owner has never returned to reclaim them. The Porsche 911 has been the go-to sports car for many a decade now. The 964 generation Porsche 911 was manufactured between 1989 and 1994 and was the second last gen of 911s to use air-cooled engines. 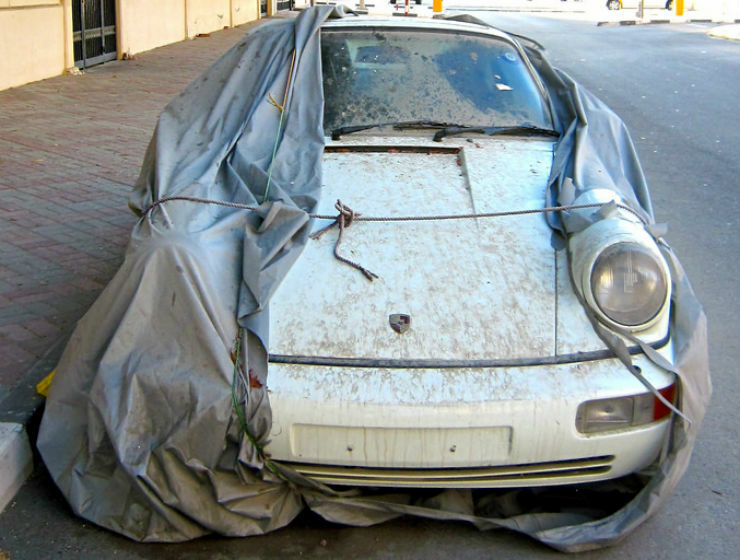 This example of the 911 was found parked and covered on a Dubai street with the owner nowhere to be found. The BMW M6 was the high-performance variant of the 6 Series Coupe. The M6 seen here is the one internally codenamed E63 by BMW which was powered by high-revving 5.0-litre naturally aspirated V10 that produced 500 Bhp. This M6 was found covered by Dubai’s sands next to the sidewalk of one the many roads in the city abandoned to the cruel forces of mother nature. The Jaguar XJ220 was the fastest car in the world from 1992 to 1993. This British hypercar of the 1990s was limited to just 281 units and was powered by a twin-turbo 3.5-litre V6 engine that produced 542 Bhp. The XJ220 is coveted by many collectors but the owner of the one seen above abandoned his rare Jag to the ravages of the sands of Dubai. The Z3 was the first roadster from BMW to enter mass production. The BMW Z3 was quite a popular car in the early 2000s, especially in the United States. The Z3 was offered with multiple naturally aspirated straight-six engine options. The BMW Z3 seen above has been left lying unattended for a few years in Dubai.